U.S. 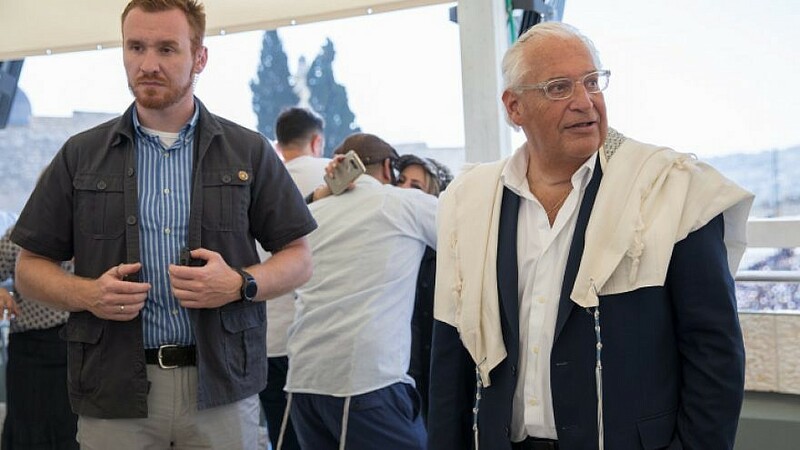 Ambassador to Israel David Friedman visits the Western Wall in Jerusalem for the priestly blessing for Kohenim during the intermediate days of the Jewish holiday of Passover. He is encouraging an official mezuzah-hanging ceremony for May 14, when the new U.S. Embassy in Jerusalem is scheduled to be dedicated. (April 2, 2018 / JNS) A whopping 100,000 people made pilgrimage to the Old City of Jerusalem on Monday for a twice-annual mass blessing by the Kohanim—Jewish people descended from the biblical Aharon and designated as priests. Among those was U.S. Ambassador to Israel David Friedman. Friedman was one of hundreds of Kohanim who gave the blessing, and told Kan news that he arrived to the massive event with his son and grandson, who also participated in giving the blessing.